Standing height teller pedestals with two cash tray drawers and two cupboards is designed to be both attractive and functional, offering security while complementing your interior design. Constructed from 18 and 20 gauge cold-rolled steel, formed, welded and ground flush to provide a secure and handsome pedestal. All drawers are mounted on full ball-bearing suspensions, which carry a LIFETIME WARRANTY. All doors are of double-wall construction and mounted with a piano hinge. 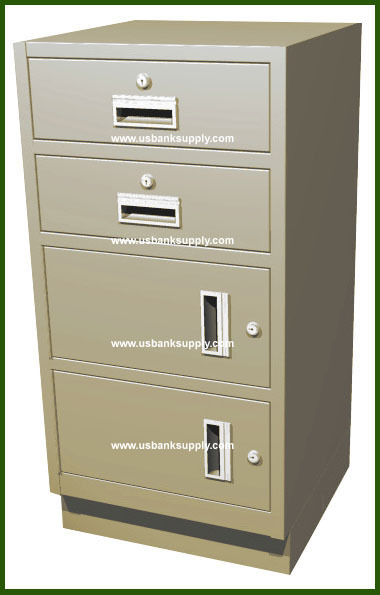 Model US110TP teller pedestal has 2 "S" drawers, 2 storage compartments with drawers, magnetic latches, adjustable levelers, 4" removable base. Dimensions: 38" H x 19" W x 19" D. (Inside drawer dimensions 4-1/4" H x 15-11/16" W x 16-5/8" D. Wt: 135 lbs. Choice of right or left door swing. Choose from 9 finish colors. Model USTPS205 standing height teller pedestal with 2 cash tray drawers and 2 storage compartments, magnetic cupbard latches, adjustable leg levelers, 4" removable base. Wt: 135 lbs. Choice of right or left door swing.